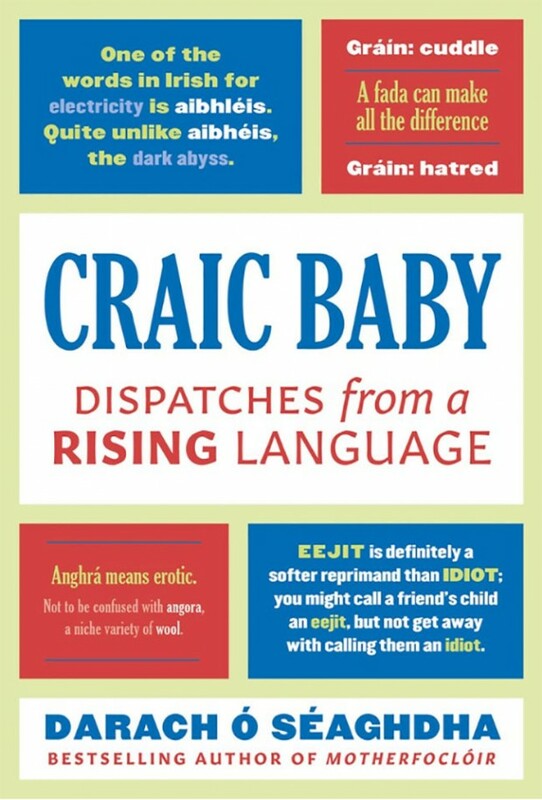 Craic Baby: Dispatches from a Rising Language – a title with an edge, you might say; and, in the round, a fitting follow-up to the author’s first contribution to the world of non-fiction – Motherfoclóir: Dispatches From A Not So Dead Language (2017, also published by Head of Zeus Ltd). Both book titles can be considered preludes to the author’s own witty and accessible writing style. In Craic Baby, Ó Séaghdha takes us on an interesting journey through his thought process; as he ponders life with Down’s Syndrome for his new born daughter. Along the way, he stops off to address many matters of interest, concern and hope as a parent – and as an Irish speaker – in modern Ireland. Writing about Irish, in English, and its role in our society, might well raise some eyebrows (at least outside of academia); but fret not, the author has found a healthy equilibrium. This book is ideal for those without much Irish who have an enthusiasm, or even a passing interest, and who may be thinking of dipping their toe in once again. Fun facts, efficacious phrases and an interesting discussion of Hiberno-English (i.e. English in Ireland) make Ó Séaghdha’s work an enjoyable amalgam of past and present. There is plenty to plé for the ardent Gaeilgeoir too; and in fact, plenty for the ardent Irish language opponent. The book challenges many of the now cliché positions of Irish Language critics unhappy with how Irish is taught in schools; or who see no contemporary role for the language. Equally, the author challenges the ‘faux traditionalism’ and old-fashioned thinking of some proponents of an Ghaeilge in education and beyond. Notwithstanding these points, Craic Baby isn’t all weighty or fastidious argument. Ó Séaghdha seeks a balance of seriousness, humour and light-heartedness. Whilst successful in this endeavour, he could, perhaps, be accused of lacking detail or in-depth inquiry in parts of the text. Nonetheless, reader accessibility seems high on the author’s agenda. It isn’t a sin for a Gaeilgeoir (or a Béarlóir) to enjoy light, entertaining reading…or writing…even in English. Craic Baby is intelligent though not necessarily academic. Just as the author desired, I would suggest. Whilst this is not to be considered a dictionary, much of the work is certainly lexical in nature; with particular focus on interesting vocabulary and the comparison of similar words. Ó Séaghdha weaves us through a variety of themes and thoughts on terminology, technology, business, magic and Old Irish. Dare I say it, even politics and Brexit get a touch. Hooray for the United Kingdom! In Craic Baby, Darach Ó Séaghdha has made another positive and important contribution to mainstream discourse surrounding the Irish Language. His obvious ability and humour prevail; and he has successfully created content that can prick the consciousness of the English-speaking general public. Those of us committed to the revival of the language should take stock. There is undoubtedly a role for this type of easy-access non-fiction, as we continue the battle to attract more learners and convince the naysayers.